UMN Expert: Why so many potholes? 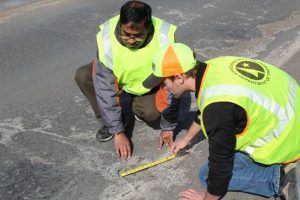 Manik Barman (left) measures a pothole with a University of Minnesota Duluth graduate student Jared Munch (right). This winter had historic records of snowfall and cold temperatures. Besides causing ice dams, the winter weather took a toll on Minnesota roadways, which motorists are experiencing with potholes. University of Minnesota expert Manik Barman eplains why there appears to be more potholes this year and how maintenance crews can determine the best way to patch each pothole. “Not only have humans and animals been impacted by the cold, but our roadways have also suffered from this year’s brutal winter,” said Barman. The record cold temperature has created a large number of new and wider cracks in pavements. As temperatures warm and the snow thaws, we are seeing new and high severity potholes every day. The challenge is how to patch these enormous numbers of potholes effectively so that the patches last longer. In a Minnesota Department of Transportation funded research study, the University of Minnesota Duluth has developed a best practices manual for patching potholes for asphalt pavements. This manual suggests the most effective patching method for potholes, based on the location, area, depth of pothole and season. This manual has simple and easy-to-use decision trees and is available in the form of flash cards and posters. Maintenance crews can determine the most effective patching method for their job, and also can refer the guidelines on the pothole preparation, placement and compaction, and moisture abatement procedure. Barman, is an assistant professor in the Swenson College of Science and Engineering at the University of Minnesota Duluth and a scholar with the Center for Transportation Studies. His scholarly focus is on pavement design, rehabilitation and maintenance. He is currently researching pavement rehabilitation and maintenance issues, fiber reinforced concretes for long-lasting pavement rehabilitation and asphalt mixtures for low volume roads.